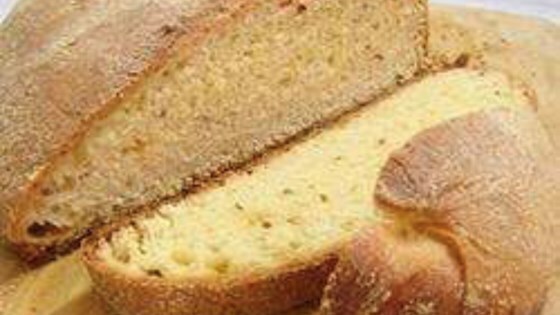 "This Portuguese cornbread is amazing with soup. Deserves to be more popular than it is." Heat milk in a small saucepan over medium heat until it begins to bubble. Whisk in butter and 2 teaspoons sugar. Add cornmeal and whisk until mixture reaches a thick, sauce-like consistency. Remove from heat and let cool to room temperature. In the meantime, sprinkle yeast and a pinch of sugar over warm water. Stir and let stand until yeast softens and begins to form a creamy foam, about 5 minutes. Combine flour and salt in the bowl of a stand mixture fitted with the dough hook. Add the yeast mixture and mix on low speed. Slowly pour in the milk mixture. Knead into a slightly dense dough. Remove from the bowl and roll into a ball. Grease the sides of a bowl or pot with olive oil and add the dough. Cover with plastic wrap and let rise in a warm place until doubled in volume, about 2 hours. Punch dough down and roll into 2 boules, or flat-bottomed balls. Place boules on a baking sheet lined with a silicone mat. Sprinkle tops with flour and cover with plastic wrap again. Let rise until puffy, about 1 hour. Preheat the oven to 500 degrees F (260 degrees C). Fill an oven-proof pot with 4 to 5 cups water and place on the bottom rack of the preheating oven. Cut 4 shallow slits into the tops of the puffed bread boules in a cross pattern, 2 parallel lines up and 2 across. Bake in the preheated oven for 10 minutes. Spritz tops with water from a spray bottle. Reduce oven temperature to 400 degrees F (200 degrees C) and continue baking until crusts are a deep brown, about 20 minutes. Remove breads from the pan and let cool for 20 minutes. It does make a good rustic loaf, surprised I don't taste the corn meal as much as I thought it would. What is the measurement of a pat? 1 Tablespoon? I rated it 5 stars since the ingredients look great.